Wikipedia says there are claims that Cajun-creole fusion chef Paul Prudhomme created this dish as part of the festival Duvall Days in Duvall, Wa in 1983, but this is unverified. A November 2005 National Geographic article by Calvin Trillin traced the American origins of the dish to "Hebert's Specialty Meats" in Maurice, Louisiana. They have been commercially producing turduckens since 1985, when an unknown local farmer brought in his own birds and asked Hebert's to prepare them in the now-familiar style. The company prepares around 5,000 turduckens per week around Thanksgiving time. As the turducken's popularity has spread from Louisiana to the rest of the Deep South and beyond, they have become available through specialty stores in urban areas or by mail order. 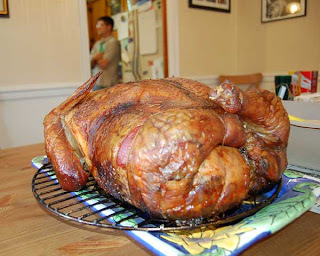 The popularity of turducken is mostly limited to the United States.